Toddler tantrums. Tween hormones. Sibling wars. 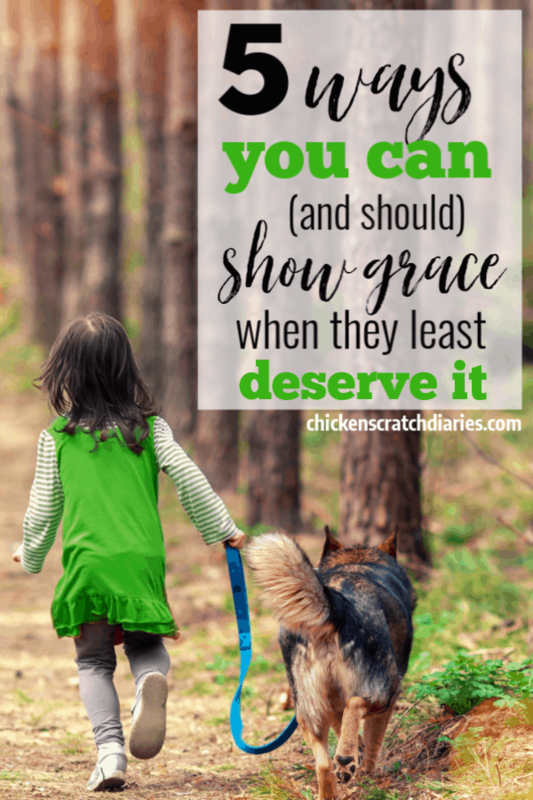 In the midst of the everyday chaos that is parenting, showing our kids God’s grace is sometimes the last thing on our minds. From the littles to the bigs, raising kids isn’t for the faint of heart, is it? And inspiring them to follow Jesus – that’s the most difficult part. Keeping our eyes on the ultimate goal. Knowing that simple actions we take today can steer our kids to embrace their Savior and understand the fullness of His love; this requires parenting with great intention. 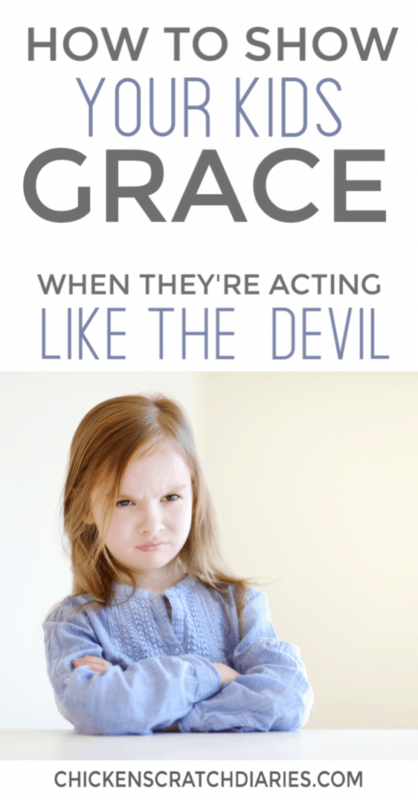 As we hope to raise kids who will walk in faith, one of the (many) things I think we can do as Christian parents is to reinforce the concept of grace. It’s one of the most important things our kids need to grasp, yet it can be the HARDEST to show our kids when they’re testing our patience to the limits! 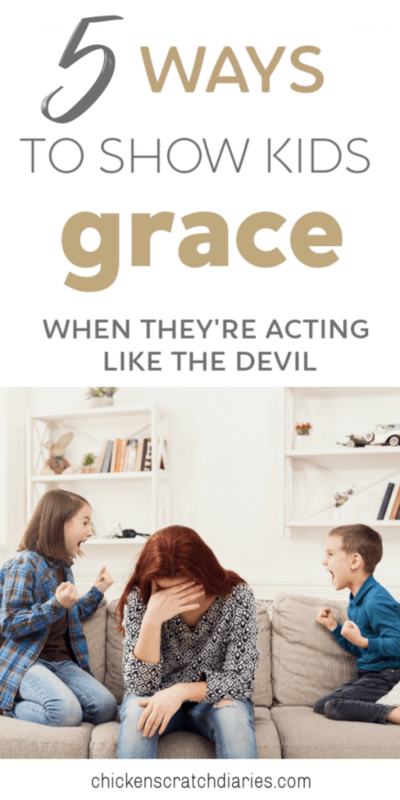 Here are five ways I think we can model grace in trying circumstances and demonstrate to our children exactly what the unmerited favor of God really looks like. I think the more rebellious and out of control our kids are acting in the moment – the more calm we need to become in that moment. Just like enforcing limits provides a sense of security (that they won’t understand at the time); being the calm in the storm can really help to diffuse those intense emotions. Again, this doesn’t mean giving in to their demands or compromising the rules. We can hold the limit while loving the child. In fact, IF we love the child, we’ll hold the limit. Our kids need to see that we can’t be “moved” by their ugliest outbursts. And this can be a powerful example of God’s unconditional love for all of us despite our sin. Enforcing consequences and remaining calm are visible ways to display this kind of love that does what is best for our child – instead resorting to a temporary “fix” (compromising or removing limits, giving up/ giving in). If one of my youngest kids is throwing a tantrum, I will usually just step out of the room. I choose not to feed into their bad behavior and let them know I’ll be in the other room while they finish throwing their fit. Giving them a little space usually is the best solution for diffusing an angry child. When you need to communicate with a child in the middle of their chaotic behavior, try talking in a very soft voice. This makes them have to pause to hear you (if they really want to know what you’re saying, that is). When it’s gone on too long, though, sometimes I realize that we all just need a change of scenery. So instead of piling on more (ineffectual) punishment, I’ll take my child outside (this does wonders for babies too!). You could also go for a car ride, ask them if they want a snack (it really could be the cause of the behavior), or see if they’d like to sit down and color with you. Empathy does wonders for a small child with overwhelming emotions. We’ve all heard that negative attention is still attention. Kids will often act out to gain what they want from us: a response, acknowledgement, a need to be met in some way. Emotional needs are just as important as physical needs. Try calmly asking your child if he’d like to join you in an activity, reading a book or helping you to cook dinner. Address the behavior as you feel appropriate, but then quickly redirect to some time with you, if you think attention might really be the heart of the matter. I know that each of my kids goes through phases where they have a greater need for attention than at other times. This can be brought on by some change in our family routine, or some physical ailment like teething or a growth spurt. My two-year-old went through a good two months recently where she wouldn’t leave my side or play alone at all. It was frustrating and downright annoying, honestly, when I needed to get anything accomplished at home. But realizing it was a phase, and she needed more attention — meeting the need instead of punishing the behavior — worked wonders for both of our attitudes. And it made me think that we ALL have these moments in life, even as adults. When I’m going through some type of transition, it’s normal for me to want to be closer to my (heavenly) Father. I can become a clingy two-year-old on any given day, in fact! Read Next: Are you Intentionally Spending Time With Family – or Just Marking Time? Forgiveness and grace are such inherently intertwined concepts that you can’t really talk about one without the other. During those difficult parenting moments when my kids are testing my limits to the max, I have to fight the urge to over-punish. It’s one thing to hold to a limit, but it’s another thing to keep tacking on punishments and re-hashing prior offenses. It’s not fair to remind our kids of their past failures when they’ve screwed up. Kids who have been raised (thus far) with a strong value system usually KNOW they’ve messed up, even if they don’t appear to be repentant at the time. I have to be really intentional to avoid the “and another thing…..” laundry list of lectures when our kids are misbehaving. It’s so important to just let the lesson be the lesson. There will be another lesson, another day, for another offense. And when that time comes – avoid revisiting the current offense. Don’t bring it up again. Showing grace requires immediate forgiveness. The kind of love that doesn’t hold grudges or remember wrongs also inspires hope in our kids that they will choose better next time. It shows them we believe in them and we honor their capability to grow from this lesson. I picked up a book at a yard sale a several years ago when my first daughter was very young. I’m actually not going to list the name of it, because I think it has some controversial parenting methods in it that I wouldn’t personally recommend. One thing I cherry-picked from the book that was impactful and positive, in my view, was the author telling a story about how her son had disobeyed in some way, and how her husband handled the punishment – this time. First, he told his son he would need to get down on the floor and do a certain number of push-ups. Before he could attempt it, though, the father got down on the floor and did the push-ups for him instead. In an attempt to help his son visualize God’s grace, he took the punishment for him. This example stuck in my mind for many years as I thought about discipline. 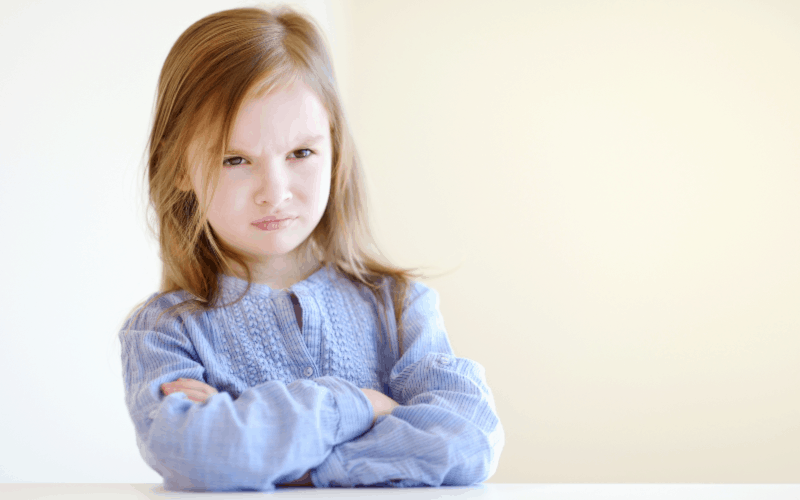 Why do kids need discipline? To correct behavior; to understand we’re all accountable to a higher authority (ultimately, to God); to build character and integrity and all of those traits we hope will result in turning out really good humans. I don’t know the exact timing “taking their punishment” should occur, but I have a feeling we’ll know when that time comes. Maybe you’re going through a particularly difficult season with your child. Maybe he’s had sooooo many opportunities to “build character” lately that you’re flat-out exhausted with discipline. If so, change things up and take their punishment. Surprise them by an act of grace now and then. Better yet – cover them in grace daily. Maybe if we truly understood the depth, the breadth and the cost of the grace God affords all of His children – including us – it would change our entire family dynamic. May we, as parents, be a willing conduit of this powerful, undeserving kindness that transforms our own hearts as it flows through our homes.